First of all we would like to welcome new Friends who have joined us from St Hilary and Bonvilston. Our numbers at Villagers Against Drilling are growing as steadily and strongly as is our determination to fight this Application to drill for gas. Please help spread the word and direct your neighbours and friends to www.llantrithyd.com to keep informed or follow us on Twitter @llantrithyd. Jane Hutt, Assembly Member for the Vale of Glamorgan, has requested a meeting with Villagers against Drilling. Ms Hutt, who has already written a letter of objection to the Vale of Glamorgan Council and offered her support to the campaign, will join members of the Steering Group in viewing the proposed drilling site from neighbouring land on Saturday 15th June at 09.00.It would be great if a good number of us could be present to demonstrate our solidarity. We intend to get to the site through a field gate which is opposite the house, Twin Pines on Brewers Lane. Brewers Lane is the road that leads up the hill to the Bonvilston to Llancadle road from Llantrithyd crossroads (The Cross). Parking is very limited and access into and across the field is only suitable to 4×4 vehicles. If you have a 4×4 please bring it along and you could then help ferry others to the site location. Those without a 4×4 could you please arrive at the field gate on foot. On her way to the meeting, Ms Hutt will be faced with a visible demonstration of our campaign in the shape of dozens of signs placed along the road leading past the field where Coastal Oil & Gas Ltd want to drill the borehole. We have received a message of support from Robert McGhee of the ‘Vale Says No’ campaign and a notification of a meeting that they intend to hold at Cowbridge Town Hall at 7.00pm on Wednesday 26th June. 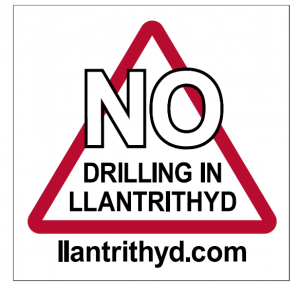 The purpose of the meeting is to raise awareness of the impacts of drilling in the Vale of Glamorgan and to galvanise the support that is mounting throughout the county. Robert is willing to answer any questions you may have on his number: 077121961150. Enquiry inspector Emyr Jones is quoted here as saying “Any extraction ( of gas) proposals would require a further application and the Vale of Glamorgan Unitary Development Plan makes it clear that the grant of planning permission for mineral exploration will not indicate a presumption in favour of future exploitation.” If the application to “Drill an exploration borehole to test for conventional gas reserves in the Devonian” finds gas then Pandora’s Box will be opened! We must stop them before they find any! However, there is no confusion as to reactions to drilling proposals by Coastal Oil & Gas Ltd. The Gem reported on Thursday that Suzy Davies, the AM for South West Wales, is attacking plans to drill a borehole on land near Merthyr Mawr! I’m sure we all totally support the opposition to gas exploration in such a historically important and beautiful location.